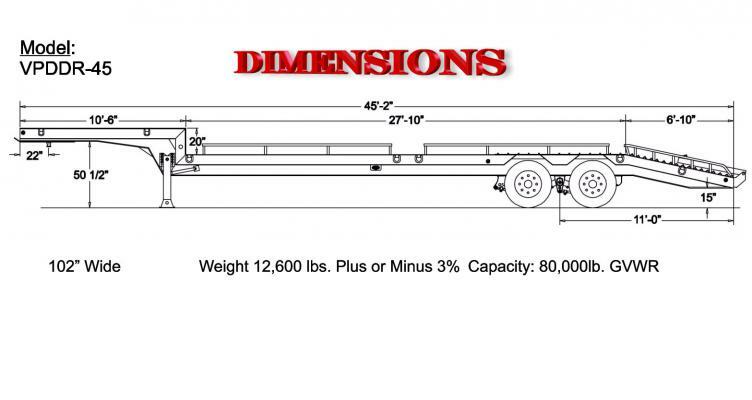 Bright Coop, Inc. is the authorized dealer for Viking Specialized Poultry Trailers. 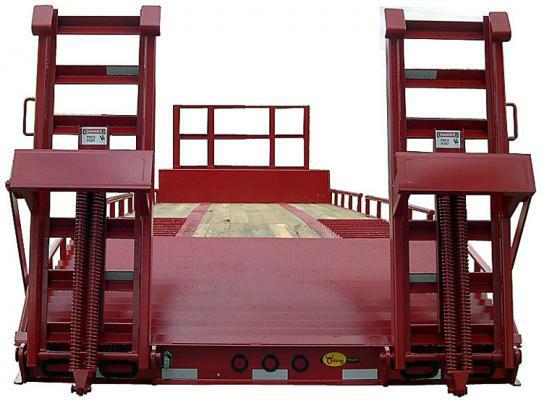 The Two Lift Transport trailer was designed to deliver two 4-wheel machines on site. It also has the ability to haul fuel and other items needed in the field on the upper deck. The two lift transport is a must have when getting equipment delivered on site. Three wheel machines can also be hauled with the addition of a third ramp. Capacity: 80,000 lb. GVWR. 16” Fabricated main beams, 1/2” x 6” top flange and 3/4” x 6” bottom flange in the neck and 1/2” x 6” top and bottom flange in the lower deck with1/4” web throughout that is welded on both sides for superior strength. 6” x 7.3# Jr. I-beam on 16” centers. 2” SAE kingpin, 3/8” kingpin plate, 22” kingpin setting (standard). 8” x 8.5# (Inverted) structural channel. HUTCH® H9700T three point spring suspension with hi-arch heavy duty 3 leaf springs. (2) 25,000 Lb., 5” round, 5/8” wall. 16-1/2” x 7”, Type 30/30 brake chambers, outboard drums, Meritor WABCO® (2S/1M) ABS on one axle. 8.25 x 22.5, Steel 10 hole disc, hub piloted (color: white). Holland® Mark V 2 speed gear with 62,500 lb. lift capacity; 200,000 lb. static capacity (standard). Shotblasted and painted with a high solid polyurethane paint. Colors: black, red or cat yellow (standard). 1-1/2” Shiplap treated pine (standard). 1/4” tread plate with 1” traction bars over tandems. 7-Way main receptacle, sealed wiring harness, rubber mounted LED lights. 3 Lights per side including mid-turn. Set at 132” from the rear of the dovetail. 6’ 6” Long; self cleaning inverted angle iron. (2) 6’ Stand up ramps with double compression springs.